A Warm Hello from Your Dentist in Canton OH! 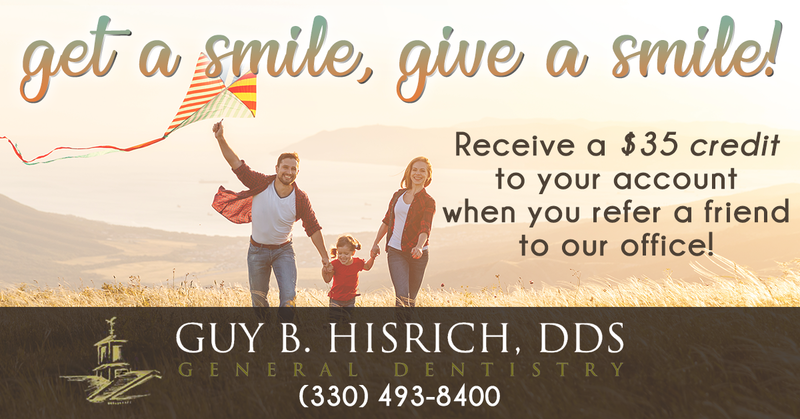 A healthy and happy smile is the ultimate goal here at the dental office of Guy B. Hisrich, DDS. With the help of our professional and welcoming staff, your dentist in Canton OH shows their commitment to providing you with the best dental and oral care and treatment around! Combined with the latest technology and years of dental experience, Dr. Hisrich wishes to give patients high-quality care that they deserve in order to share your healthy smile with the world. Here at our Canton OH dental office, we offer a variety of services for adults and kids alike, including dental cleanings for your bi-annual checkups, cosmetic options like teeth whitening and porcelain crowns, and advanced services like dental implants and dentures. We believe it is important for our patients to feel comfortable, as well as providing affordable work for all. To schedule an appointment or consultation with your Canton dentist, call our office today at (330) 493-8400! Superior Dental Care, Continuing a 50-Year Tradition. In 1960, Dr. Paul Hisrich established a dental practice that provided quality care at reasonable prices. In 1990, Dr. Guy joined the practice with very much the same approach to dentistry. Dr. Paul has since retired, but Dr. Guy continues to maintain a place where patients can get excellent dental care at a fair price from a friendly staff in a relaxing and professional environment. Dr. Guy prides himself on being able to continue his father's tradition of building caring and trustworthy relationships with his patients and the community he serves. Dr. Guy Hisrich is proud to offer a pleasant atmosphere that, along with his calm demeanor, proves to be extremely effective at helping many with high dental anxiety. Dr. Guy also offers the latest state-of-the-art technologies in order to provide the absolute best for his patients. When you visit our office, you can be confident that you are receiving the finest and most advanced dental care.